Zoltán Fejérvári has emerged as one of the most intriguing pianists of a new generation of Hungarian musicians—a virtuoso in the truest sense who’s in demand on the world’s concert stages. 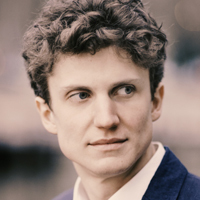 Winner of the 2017 Concours musical international de Montréal and recipient of the 2016 Borletti-Buitoni Trust Award, Mr. Fejérvári has appeared in recital throughout Europe and the United States, including at Carnegie Hall in New York City; the Library of Congress in Washington, DC; the Kimmel Center in Philadelphia; the Gasteig in Munich; the Auditorium del Lingotto in Turin; the Biblioteca Nacional in Buenos Aires; the Palau de la Música de València; and the Liszt Academy in Budapest. He has performed as a soloist with the Budapest and Verbier Festival Orchestras, Hungarian National Philharmonic Orchestra, and Concerto Budapest Symphonic Orchestra, among others, and he has collaborated with such conductors as Iván Fischer, Gábor Takács-Nagy, Ken-Ichiro Kobayashi, and Zoltán Kocsis. During the 2018–19 season, Mr. Fejérvári appears in recital, in chamber music performances, and as a soloist with orchestras. In August 2018, at the request of Sir András Schiff, a longtime mentor to Mr. Fejérvári, he performed two works by György Kurtág—…quasi una fantasia…Op. 27, No. 1, and the Double Concerto, Op. 27, No. 2—in Mr. Schiff’s stead at the Lucerne Festival. In September, he performed a program of works by J. S. Bach and Schumann at Classical Spree, the festival of the Montreal Symphony Orchestra. Later engagements throughout the season include appearances in Kalamazoo, Michigan, as part of the Gilmore Keyboard Festival’s Rising Stars Series; at Union College in Schenectady, New York; at The Coast Recital Society and the Vancouver Recital Society in British Columbia; and in concerts in Budapest and Turin. He also performs at the Borletti-Buitoni Trust’s 15th-anniversary concert and tours twice with Musicians from Marlboro, playing chamber music in Greenwich, Connecticut; New York City; Schenectady; Philadelphia; Washington, DC; Brattleboro; Montreal; Ames; and San Francisco. Orchestral engagements for Mr. Fejérvári include Beethoven’s Piano Concerto No. 1 with the Budapest Festival Orchestra, led by Iván Fischer in Budapest and on tour in Warsaw, and a pair of contrasting concertos at the Liszt Academy in Budapest: J. S. Bach’s Concerto in F Minor, BWV 1056, and Shostakovich’s Piano Concerto No. 1. Mr. Fejérvári also appears in duo recital with the Hungarian cellist István Várdai in Jülich, Germany, and at Paris’s Théâtre des Abbesses. Violinist Rosanne Philippens joins the duo for performances of keyboard trios in Amsterdam. Mr. Fejérvári is a frequent performer of chamber music. He has collaborated with the Keller and Kódaly Quartets and with violinists Joseph Lin and András Keller; cellists Gary Hoffman, Christoph Richter, Ivan Monighetti, Frans Helmerson, and Steven Isserlis; and horn player Radovan Vlatković. He has appeared on the Kronberg Academy’s Chamber Music Connects the World program; as part of IMS Prussia Cove’s Open Chamber Music Seminar; at Lisztomanias in Châteauroux, France; at the Tiszadob Piano Festival in Hungary; and at Encuentro de Música in Santander, Spain. At the invitation of artistic director Mitsuko Uchida, Mr. Fejérvári participated in the Marlboro Music Festival during the summers of 2014, 2015, and 2016. For the 2017–18 season, Sir András Schiff selected him to participate in his Building Bridges concert series, which was established to highlight young pianists of unusual promise. Under this aegis, Mr. Fejérvári gave recitals in Berlin, Brussels, Zurich, Bochum, and Ittingen, among other cities. Zoltán Fejérvári’s recording of Liszt’s “Malédiction” Concerto with the Budapest Chamber Symphony for the Hungaroton label won the 2013 Grand Prix du Disque. The following year, he released a recording of four sonatas for piano and violin by Mozart with violinist Ernő Kállai, also issued by Hungaroton.